The Laser Guard is an innovative Heron Deterrent device developed alongside ornithological experts to create the most effective heron scaring product possible. 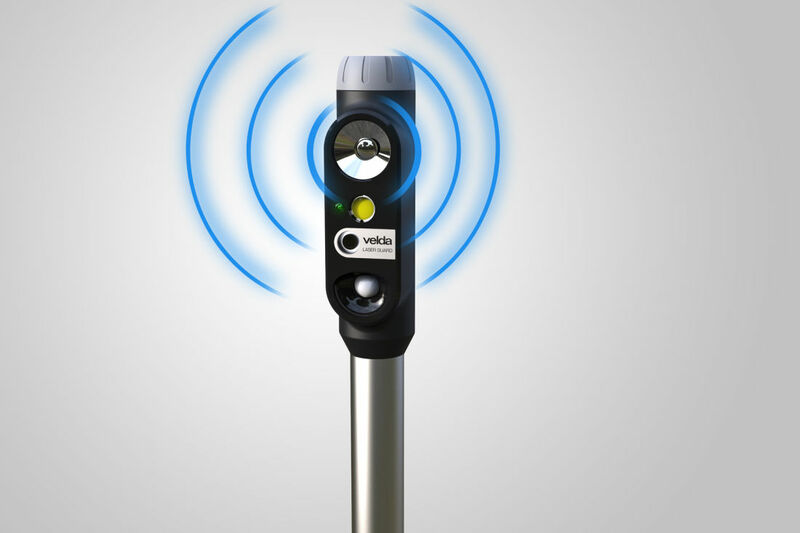 The Laser Guard works with a motion detecting PIR to respond only when a predator comes into the field of vision. The Laser Guard has 3 different scare functions which initiate for 30 seconds at different intervals over the course of a minute. 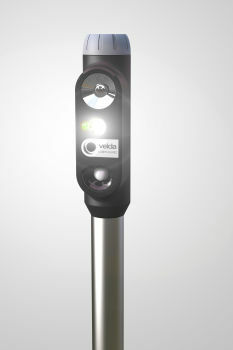 The unpredictable flashing LED light is the first action, engaging as soon as the motion sensor picks up movement. This is overlapped by a green moving laser beam display after 15 seconds. 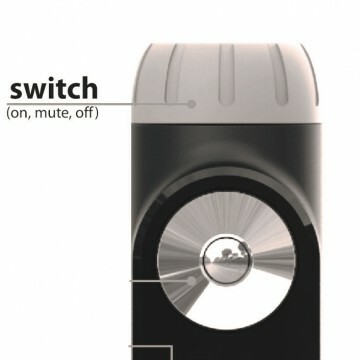 After 30 seconds the flashing LED cuts out and the noise function comes into effect, producing a number of loud, threatening sounds to accompany the laser beams (this can be muted if required). This approach is based on variation due to the Herons notorious nature for learning and becoming immune to single function methods and constant patterns of sound and light. 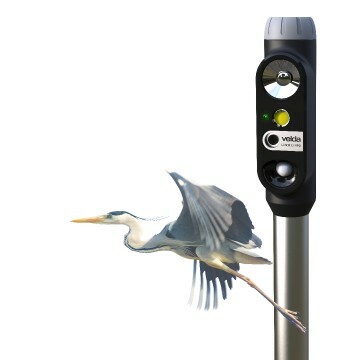 The combined function approach, dynamic flashing, movement and sound variation does not allow the heron to recognise a fixed pattern. 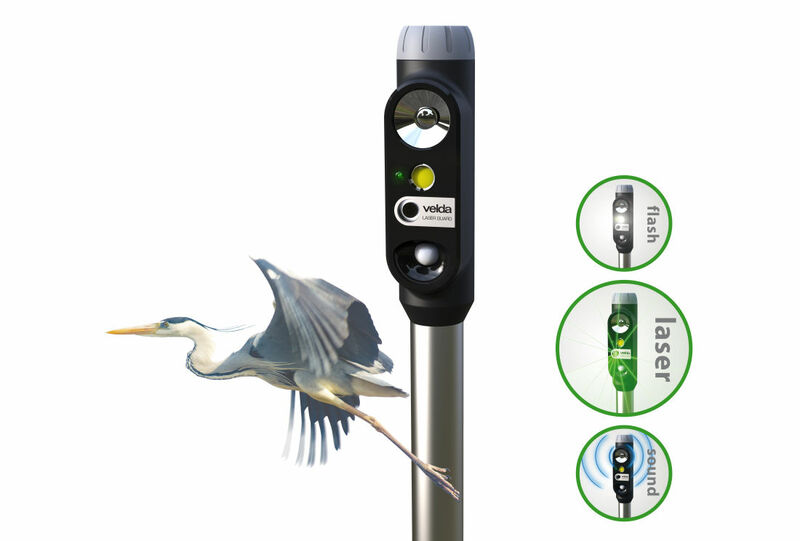 The Laser Guard has continuously produced the desired results in testing, with the Heron always taking flight. The Laser Guard also proved very effective against other garden predators such as cats. Motion detector has 100˚ angle of vision at up to 12 metres distance. 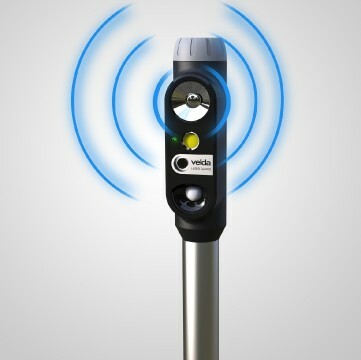 Flash LED at variable frequency, so no pattern can be detected by birds. Green laser beams are most visible to birds and moving laser beams startle them. Sounds include Herons in distress, dogs and even poison dart frog calls (Herons are migratory birds). 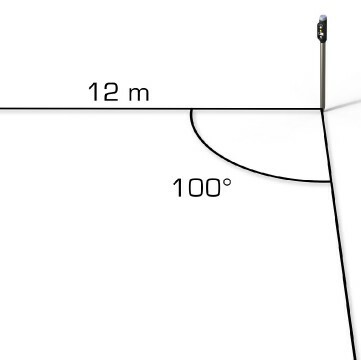 Simple stake mounting into ground with 5 metre electic cable. 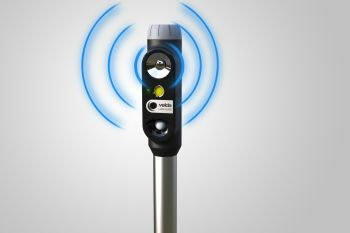 Laser Guard Heron Deterrent - Product Features. The variable frequency flashing LED is the first feature activated (as soon as the motion sensor detects movement). 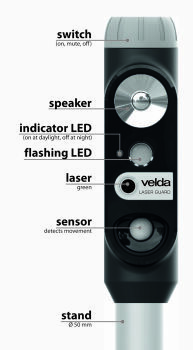 This variable flashing light continues for 30 seconds after activation, running alongside the green laser beams for the latter 15 seconds. 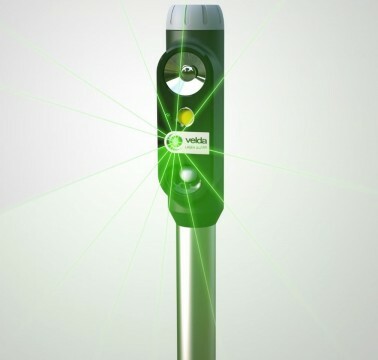 The moving green laser beams activate after 15 seconds and produce a highly visible dazzling distraction alongside the Flashing LED for 15 seconds, with multiple moving dots. This continues to 30 seconds (a further 15 seconds after the Flashing LED stops). The threatening sounds feature comes into play after 30 seconds, producing highly audible, startling noises alongside the moving laser beams for the first 15 seconds and continuing alone for 15 seconds further to complete the 1 minute cycle. 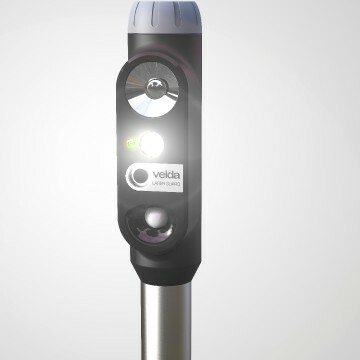 The variable flashing frequencies, moving laser beams and different audio sounds stop the Heron from becoming used to a fixed pattern and realising the lack of actual threat. Herons are clever birds can become used to single function systems over time. 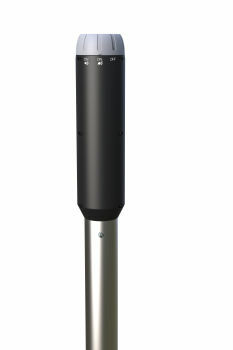 The PIR motion sensor has a 100° range of vision and can pick up movement from an impressive 12 metres away. 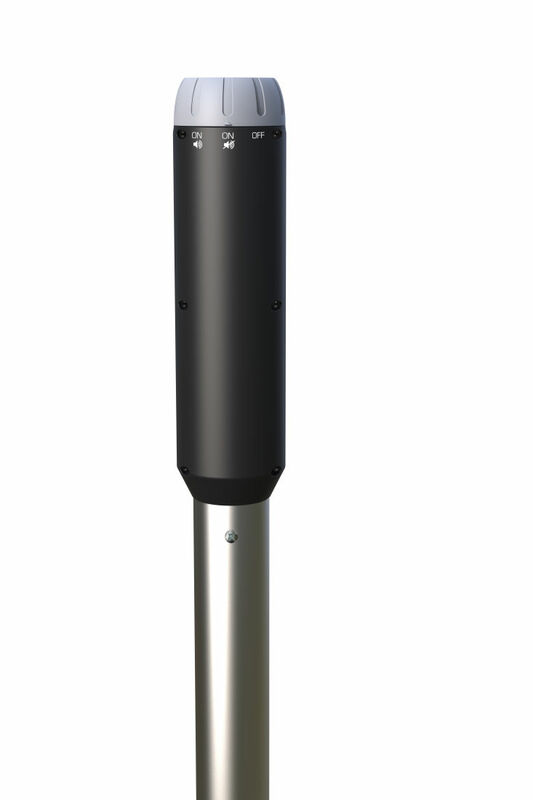 This allows the unit to be positioned so that it can guard wide pond area and not activate on movement in areas away from the pond. 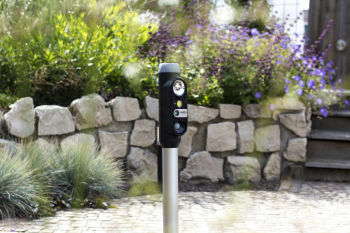 The Laser Guard Heron Deterrent feature a dial at the top which allows the unit to be switched on and off. 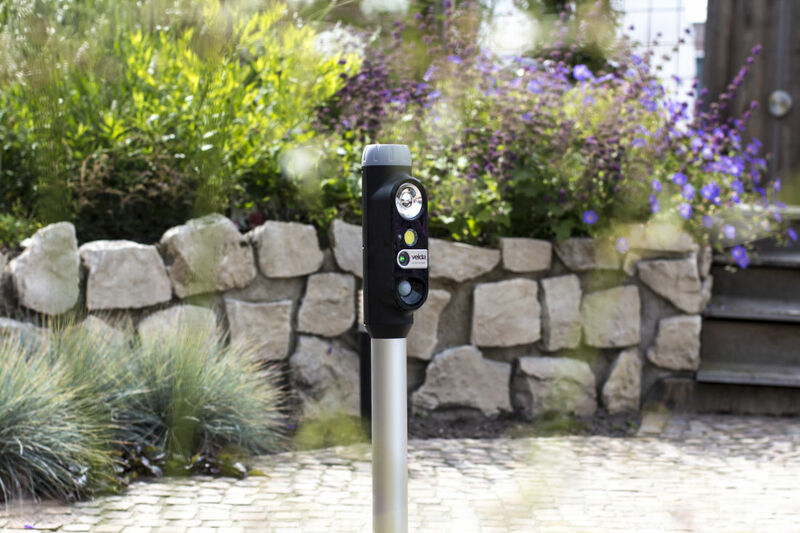 The dial also has a mute setting which silences the audio function of the unit whilst allowing the LED light and laser functions to continue to work as normal. The Laser Guard is easy to install by simply staking it into the ground in a location where it can oversee the pond. 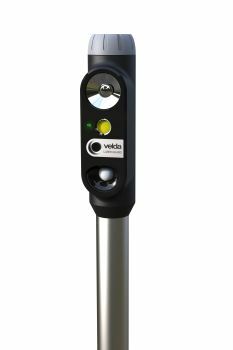 The Laser guard is rated IP44 weatherproof for outdoor use and has a 5 metre electrical cable for connection to an outdoor power supply. 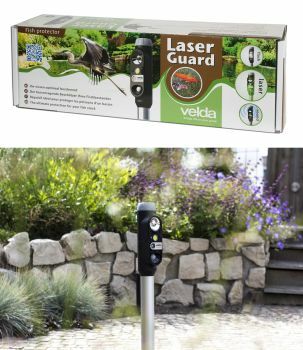 The Laser Guard has been developed with the help of bird experts to create the most advanced and effective Heron prevention product available. 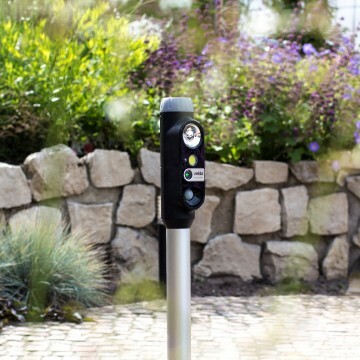 The features have been studied right down to best laser colour for visibility to achieve the best results possible. 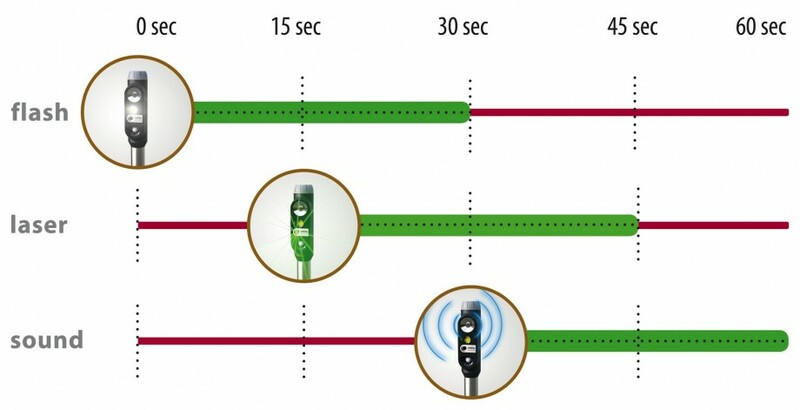 The Laser Guard performs a changing scare cycle that lasts 60 seconds in total from the moment of activation. This cycle consists of 3 deterrent methods that activate at different intervals and overlap each other. 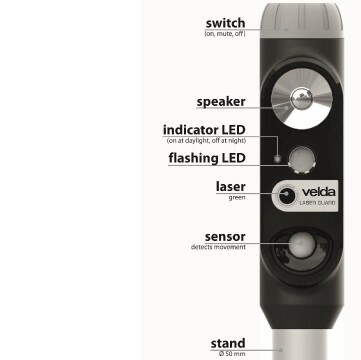 * First Action - Variable Frequency Flashing LED - starts at 0 seconds - ends at 30 seconds. * Second Action - Moving Green Lasers - starts at 15 seconds - ends at 45 seconds. * Last Action - Changing Sounds - starts at 30 seconds - ends at 60 seconds.